Studio-quality sound in a club installation mixer. 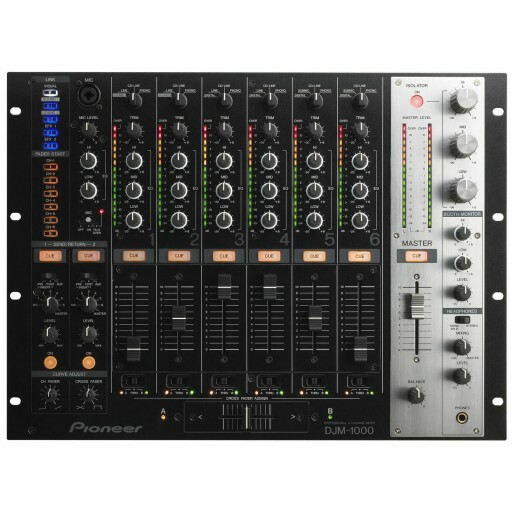 The Pioneer DJM-1000 mixer builds on the legendary DJM-600 by taking away the onboard effects (by popular request) and adding a link to connect it directly to the EFX-1000 Performance Effector plus 2 send and return channels. It also has connections for future Pioneer CD players and the DXJ-X1, plus features a BPM sync function that locks the tempos of all equipment attached. A slightly angled interface makes this rackmount Pioneer mixer the most comfortable club mixer around. The Pioneer DJM-1000 is designed for superb sound quality, transmitting analog signals via the shortest possible path and converting them to digital signals with a high-quality 24-bit/96kHz A/D converter, optimizing the signals for the digital mixing stage. 32-bit DSP means club DJs can generate pristine sound. To make the most of the DJM-1000's features, Pioneer has taken great care in perfecting its sound quality, including a high-rigidity chassis to cut down vibrations that might affect the sound. The power section has an R-core transformer, making the Pioneer DJM-1000 rack mixer ideal for club performances with a clear and powerful sound. The included 3-band isolator lets you control the level of each band from -∞dB to +6dB (kill) on each band or attenuate and accent partial bands. A 2-system, 3-type send/return (pre insert/post insert/aux) is also provided to allow multiple connection variations with external devices, such as effectors and samplers. The Pioneer mixer's fader curve adjust allows you to adjust the channel fader curve as well as the crossfader curve. Both faders' functions can be adjusted within 17 steps so that DJs can customize the settings to their own preferred response. Using digital input connectors supporting multiple sampling rates (44.1/48/96kHz), a system can be built in which no sound quality degradation occurs when connecting to external digital devices. A digital out connector with a 24-bit/96kHz sampling rate is provided, facilitating recording at studios and other situations demanding high sound quality. Supports only linear PCM. MIDI signals can be output to allow MIDI control of external devices. Multiple functions can be performed by using digital link cables to connect other Pioneer DJ CD players, DJ effectors, and AV mixers. For example, connected to a visual mixer using the MIDI output, you can control the crossfade of the video mixer by simply crossfading the audio on the Pioneer DJM-1000 Mixer.